What a weird weekend. Because of the impending storm, we planned to spend a rare summer weekend at home. On Saturday, I dashed around madly trying to cram all my weekend errands into one day. The highlight was a visit to the Waltham Farmers Market, a favorite, but one I can rarely visit because it’s on Saturdays when we are usually in Maine. We stocked up on bountiful produce: tomatoes of all shapes and sizes, corn, colorful carrots, peaches, nectarines, plums, and more. My favorite find was the cookie lady at ButterGirl Baking. We sampled a few kinds and settled on Brown Sugar Shortbread for me and Double Chocolate for Howard. Yum! The predictions for the storm were serious. There were shutdowns in New York City, train service was suspended on the Northeast Corridor, and my in-laws had to leave the NJ shore under mandatory evacuation. Several reverse 911 calls from our town urged us to “shelter in place”. So we settled in and waited for the fury to arrive. What do you do with a “summer snow day”? My house was in desperate need of cleaning, so that was on the list. Pile of books and magazines beckoned to me. And, of course, how could I spend an entire day at home without cooking? With all my running around on Saturday, I hadn’t really “planned” for any specific recipes. That made it more fun to pull together something with what we had around. It wasn’t like the cupboard was bare, so there were many choices to work with. With frightful weather outside, it seemed like the perfect day for a hearty soup, not what I would normally expect to crave in August. I was tempted by the many ears of fresh sweet corn. There was also leftover roasted chicken in the refrigerator and freshly dug potatoes. I also found a nearly full bottle of cream and its expiration date hadn’t passed. Everything needed to inspire a corn chowder. In a large soup pot, add the olive oil and butter, and heat over medium heat until the butter melts. Add the onions, and sauté until softened, about 10 minutes. Add the diced potatoes and the chicken broth. Bring to a boil, then reduce heat and simmer for 10 minutes, or until the potatoes are just tender. 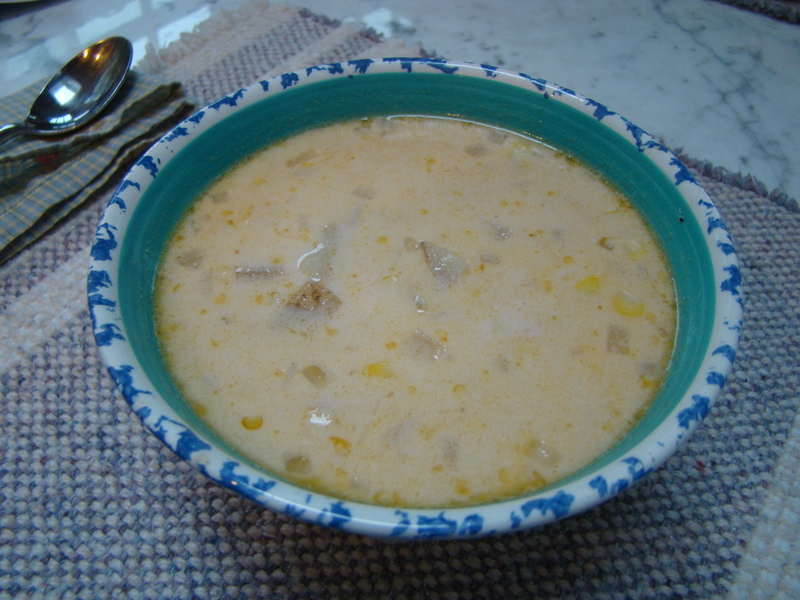 Add the corn kernels, diced chicken, pureed chipotles, and cream. Simmer another 10 minutes until warmed through. Season with salt and pepper to taste. In the end, we were relatively unscathed by the storm, at least here in Lexington. The wind and rain were wild at times. I was nervous when Howard took Bella out to walk. (For better or worse, I have a dog who will not even consider using her yard as a toilet.) Unlike friends across town, we didn’t lose power, so passed a relatively normal day. The yard was littered with small twigs and branches, but no trees came down. The basement stayed dry. Two days later, there are still people in my town without power, so I’m feeling fortunate. How we fared in Maine is a different story. A tree fell across power lines on our road, knocking out the electrical service and making travel to the main road dangerous for those that need to pass under that tree to get in or out. Current projection for restored power is Saturday, but there are no guarantees. Unfortunately, most of our neighbors are year-round residents rather than the weekenders we are, so they have no escape. We’ll go up this weekend to check out the situation. We’re hoping that the skylights we left ajar didn’t let in too much water. At the very least, we need to go empty out the freezer, which should be quite ripe by the weekend. All in all, I am incredibly thankful. It could have been much, much worse. My heart goes out to everyone left in the wake of Irene’s destruction. It’s Friday again. It was down to the wire this week for this week’s French Fridays with Dorie recipe: Café Salle Pleyel Hamburger, but the burgers got made and the post got written just in time. Burgers were the perfect thing to make while sipping margaritas. 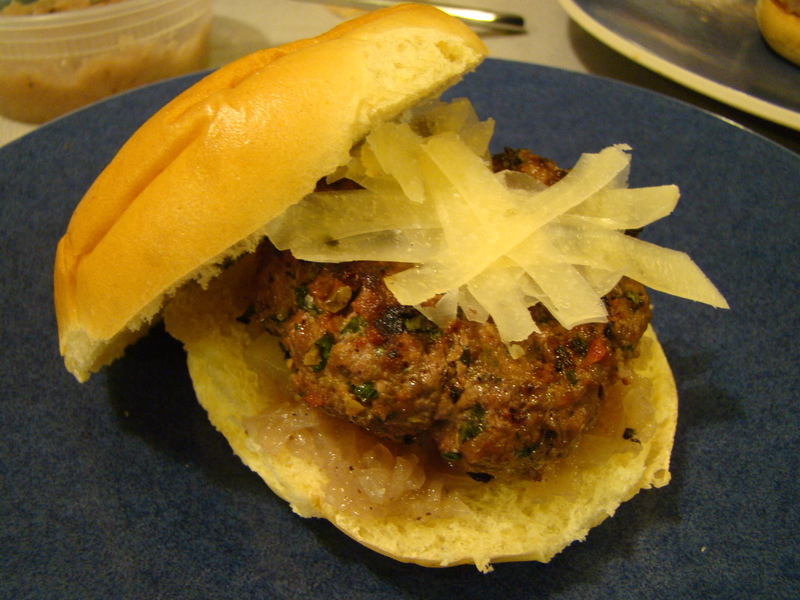 This recipe was quite simple: a dressed-up hamburger. 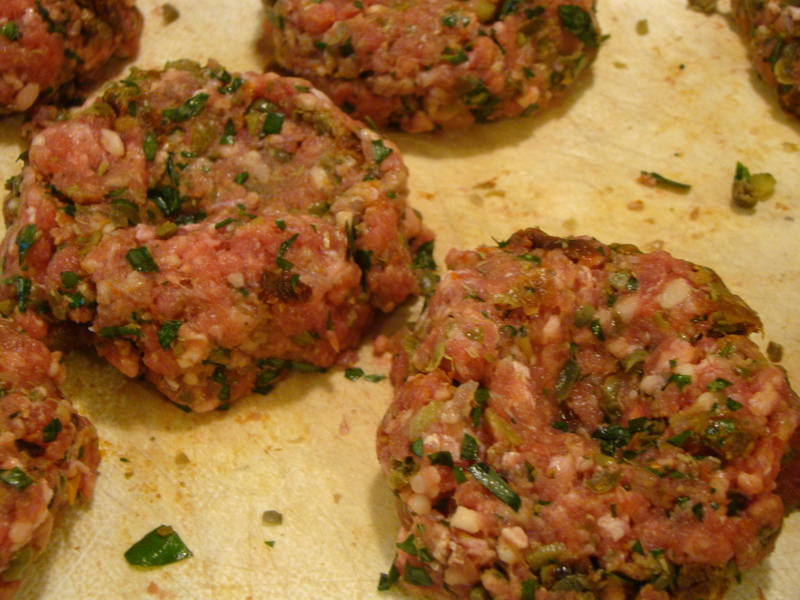 A variety of aromatics were mixed in with the ground beef. 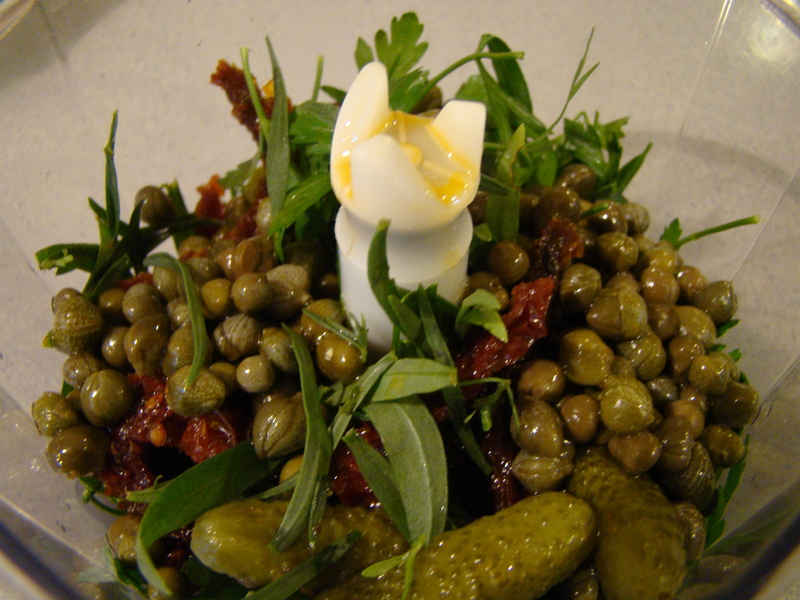 The sun-dried tomatoes, capers, cornichons, and fresh herbs dotted the meat with lovely flecks of red and green. The grilled burger was nestled in an eggy role and layered on a bed of homemade onion marmalade and sliced pickle and topped with coarsely grated Parmesan. I thought it was pretty good, though in the fantastic August lineup, probably not my favorite for the month. I made the burgers about half the size called for, which is a good portion size at our house. Unfortunately, I think the roll was then too big for the burger (my fault), so each bite was a little too bready. I should have picked up slider rolls. I tasted the burger on its own, and it was packed with flavor, so I might lose the roll when I have another for lunch tomorrow. I was also on the fence about the onion marmalade. Despite the interesting ingredients, in the end, I found the marmalade bland and boring. That might get left out from the leftovers too. I served the burgers with ears of super sweet corn and a bowl of panzanella (bread salad) made with farm fresh tomatoes. A peach and berry crisp was the perfect dessert for a summery dinner. To see what other FFwD bloggers thought about the French burgers, check out their links at French Fridays with Dorie. I always discover new inspirations and ideas from the other cooks. We don’t post the recipes, but consider getting your own copy of the book, Dorie Greenspan’s Around My French Table. Now we’ll spend the weekend waiting for Hurricane Irene’s arrival, hoping she’ll mellow out by the time she gets to the Boston area. For my family and friends in the Mid-Atlantic and point further south, stay safe!